Find out more about Euston Church by reading our latest newsletter (Sep 2018). Euston Church was born in September 2010 when around 40 people were planted from St Helen’s, Bishopsgate, with a vision to be labourers for Jesus in this exciting harvest field. We began meeting in the School of Pharmacy, before moving to the Institute of Education in 2012. We have experienced so many answers to prayer as the Lord has provided every detail and resource we have needed as we seek to serve him. In the kindness of God, Euston Church has gradually grown. We have seen students, workers, and families come to new life in Jesus, grow in faith in him, and equipped to serve. In 2015, the trustees of Christ the King, Gordon Square offered the use of their building for Euston Church. This is an amazing provision of a much more public and regular space for the ministry. We long to see the name of Jesus go out from this place to change lives and eternities in London and around the world. As one of a number of churches planted from St Helen’s over the last 20 years, we share their core convictions about the supremacy of the scriptures and their desire to reach, build and send people out to the glory of God. Euston Church operates under a Bishop’s Mission Order which was granted by the Bishop of London in January 2015. We are excited to be ambassadors commissioned as part of Capital Vision 2020. We are thrilled to be partnering with our friends from LCM on a council estate just north of Kings Cross. Members of Euston Church volunteer to help run a mums and tots group, youth clubs and ministry amongst the elderly - because London needs Jesus. We uphold the teaching of the three creeds, the articles of religion of the Church of England and the Book of Common Prayer. By the power of his Spirit, all of God’s people have a vital part to play in growing the body of Christ. Kev Murdoch is the vicar of Euston Church. He trained at Oakhill Theological College and St. Mellitus College and also completed the Ministry Training Scheme at St. Helen’s Bishopsgate. Before going into paid Christian work, Kev worked for several years as a solicitor in the City. Kev is married to Laura and they have two wee children called Rory and Jessie. Rob Mullock is the assistant minister of Euston Church. He trained at Oakhill Theological College and also completed the Ministry Training Scheme at St. Helen’s Bishopsgate. Before coming to Euston Church, he was working for the mission society Crosslinks. Rob is married to Amy and they have two sons called Fraser and Jude. Anja Schmidt is the Women’s worker at Euston Church and her particular focus is on training women for ministry. Anja is originally from Germany. She completed the Cornhill Training Course and before going into full-time Christian ministry she worked in cancer research and as a secondary Biology teacher. Anja enjoys spending time with friends, visiting National Trust Houses and hiking in the mountains. 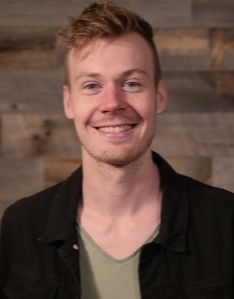 Ed Yates is the Student and international Student worker at Euston Church. He grew up in Birmingham and is married to Jane. Before coming to Euston Church he studied Modern Languages in Durham and did the Associate Training Scheme with St Helen’s, Bishopsgate. Ed likes watching cricket, rugby, and American football, books, and trying foods he’s never seen before. Sam Ridgway is the Workers’ worker at Euston Church. He heads up our lunch time workers’ ministries: Euston Area Talks and the King’s Cross Network. He worked as a Speech and Language Therapist before training on the Associate Scheme at St Helen’s, Bishopsgate. Sam is married to Fran whose love of adventurous holidays is rubbing off on him. Fran Ridgway is our part-time Women's worker. She helps to run Euston Area Talks for Christian workers in the local area and looks after women at the 5pm service. Before this Fran was a solicitor and worked for a firm in North London. Fran is married to Sam whose love of adventurous board games is rubbing off on her. Charlotte Blower is our volunteer Women's worker and focuses on looking after women from the Sunday morning congregation. She just finished training on the Associate Scheme at St Helen’s, Bishopsgate. Before that she spent 6 years in arts administration at The Royal Opera House. Char is married to Ed and lives in Crouch End and they have a little girl called Grace. Mark Morley will be joining us from April to head up our music ministry. Jonathan Forster is in the 2nd year of the Associate Scheme at St. Helen's, Bishopsgate, Jessica Forster is doing the 3rd year of the Cornhill Training Course; Luisa Hank and Fiona Menzies are in their second year of training with Cornhill and Euston Church, Charlie Tidd is doing a joint apprenticeship with Euston Church and Christians in Sports, and Theo Hayes is doing a joint apprenticeship scheme with Euston Church and London City Mission.